Langley Air Force Base, Joint Base Langley–Eustis, Virginia, U.S. The mission of Air Combat Command is to be the primary force provider of air combat forces to America's warfighting commands, the geographic Unified Combatant Commands, specifically to United States Central Command, United States Southern Command, and United States Northern Command, where ACC Numbered Air Forces serve as the air components. In addition, ACC augments the forces of the United States European Command, United States Africa Command, United States Pacific Command, and United States Strategic Command. ACC organizes, trains, equips, and maintains combat-ready units for rapid deployment abroad while also ensuring air defense of the United States is strong enough for both peacetime and wartime needs. ACC directly operates 1,110 fighter, attack, reconnaissance, combat search and rescue, airborne command and control and electronic aircraft along with command, control, computing, communications and intelligence (C4I) systems,Air Force ground forces, conducts global information operations, and controls Air Force Intelligence. Air Combat Command consists of approximately 74,240 active duty Airmen and 10,610 Department of the Air Force Civilians. When mobilized, more than 49,000 additional Airmen of the Air Force Reserve and the Air National Guard, along with over 700 additional aircraft, are operationally-gained and assigned to ACC, bringing total aircraft to more than 1,800 and number of Airmen to 123,240. Air Combat Command was created 1 June 1992 after the inactivation of the Tactical Air Command (TAC), Strategic Air Command (SAC) and Military Airlift Command (MAC). Upon activation, ACC assumed control of all former-TAC fighters, all bombers, reconnaissance platforms, battle management resources, and Intercontinental ballistic missiles (ICBMs). Furthermore, ACC had some KC-135 and KC-10 aerial refueling tankers and C-130 tactical airlift aircraft in its composite, reconnaissance, and other combat wings. In 1993, control of the ICBM force was transferred to the Air Force Space Command (AFSPC) until transferred again to Air Force Global Strike Command (AFGSC) on 1 December 2009. Following the inactivation of SAC at Offutt AFB, Nebraska, a new unified command, the United States Strategic Command, was activated at Offutt, created to manage the combined strategic nuclear forces belonging to both the U.S. Air Force and the U.S. Navy. Historically, Combat Command was an earlier air unit designation. During 1941 and early 1942, the tactical air units of the War Department, formerly known as the GHQ Air Force, formed the Air Force Combat Command. The AFCC was dissolved in the reorganization of the United States Army, effective 9 March 1942, which created the United States Army Air Forces as a major command of the Army, which functioned as a de facto independent service branch of the Armed Forces. Not long after activation, ACC underwent organizational and mission changes. The first such major change was the transfer of the combat search and rescue mission (CSAR) from Air Mobility Command to ACC. With the realigning of search and rescue units, ACC gained additional resources, as well as a new mission. The formal transfer took place on 1 February 1993, when the Air Rescue Service (ARS) was assigned to ACC. On 2 July of the same year, the ARS was disestablished and rescue units became fully integrated in the same manner as other ACC units reporting to numbered air forces. The USAF Combat Rescue School was subsequently assigned to the 57th Wing at Nellis AFB, Nevada. One of the most significant changes for Air Combat Command resulted from an overhaul of flying training responsibilities. Following its activation, ACC was responsible for aircraft-specific aircrew training, including initial weapon system and continuation training. On 1 July 1993, the 58th and 325th Fighter Wings—F-16 and F-15 training units transferred from ACC to Air Education and Training Command (AETC). 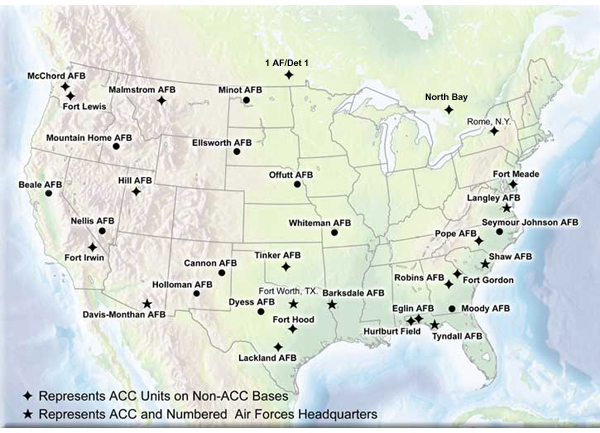 Concurrently, Luke AFB, Arizona, and Tyndall AFB, Florida, for which those respective wings were the host units, also moved from ACC to AETC ownership. However, on 1 October 2012, both Tyndall AFB and the 325th Fighter Wing returned to the control of ACC. The next major organizational change resulted from a fine-tuning of aerial refueling and airlift resources. From its activation, Air Combat Command had assumed ownership of some C-130 Hercules theater airlift assets and KC-10 Extender and KC-135 Stratotankers. Just as ownership of overseas C-130 resources had already been transferred to USAFE and PACAF commanders, it was decided that all C-130s based in the CONUS would be under the control of ACC, while at the same time, almost all KC-135 tankers would be assigned to Air Mobility Command. There was historical precedent for the reassignment of C-130s to Air Combat Command. During the earliest days of Tactical Air Command (TAC), the command had carried out the "tactical" or combat airborne aspect of airlift operations, leaving the "strategic" or logistical mission to Military Air Transport Service, later redesignated Military Airlift Command (the precursor of today's Air Mobility Command) in 1966. The tactical airlift mission included logistical airlift, airborne operations, aeromedical evacuation, and air support for special operations. This division of the airlift mission continued until 1 December 1974, when TAC transferred its CONUS-based tactical airlift units, including Air Force Reserve and Air National Guard tactical airlift units, to Military Airlift Command (MAC). MAC gained the overseas units from theater commands on 31 March 1975. On 1 October 1993, all Air Mobility Command C-130s with the exception of those permanently under United States Air Forces in Europe (USAFE) and Pacific Air Forces (PACAF) regions were transferred to ACC, while USAFE and PACAF assumed control of the C-130 permanently based in their respective geographic regions. Concurrently, all KC-10 tankers and all KC-135 tankers except those at Mountain Home AFB, Idaho, which supported the fighter and bomber aircraft of the composite wing stationed there, transferred to AMC. ACC also retained two KC-135s at Offutt AFB Nebraska and Grand Forks AFB, North Dakota under ACC control until transferring them to AMC on 1 October 1993. McConnell AFB, Kansas; Fairchild AFB, Washington; and their respective air refueling wings were also transferred to AMC in January 1994 and July 1994, respectively. In 1997, a subsequent USAF reorganization of ACC and AMC resulted in all CONUS-based C-130 theater airlift aircraft being reassigned from ACC back to AMC. This change also shifted operational claimancy for all "slick" theater airlift mission C-130s in the Air Force Reserve and CONUS-based Air National Guard. USAFE and PACAF C-130 assets remained in those respective MAJCOMs to include PACAF's operational claimancy for Alaska Air National Guard C-130 and HC-130 assets. In Southwest Asia, Air Combat Command provided active duty and reserve component forces for the follow-on to Operation Desert Storm and the establishment of Operation Southern Watch to deter Iraqi aggression. In October 1994, ACC also demonstrated its ability to react quickly to the buildup of Iraqi troops near the border of Kuwait. In addition, ACC, from its inception, has provided indispensable support to counter-drug operations, including Airborne Warning and Control System (AWACS), reconnaissance and fighter aircraft, as well as radar and connectivity assets. In addition, ACC supported United States Atlantic Command's humanitarian relief to Haitian refugees associated with Operation GTMO at Guantanamo Bay Naval Base, Cuba. Similarly, the command supported Operation Safe Haven and the processing of Cuban refugees during the latter part of the summer of 1994. Across the Atlantic, Air Combat Command units participated in Operation Restore Hope, largely an Air Mobility Command humanitarian operation intended to provide food for Somalia. Also, ACC regular and ACC-gained Air National Guard C-130 units deployed to Uganda and Kenya to participate in Operation Support Hope. This operation, conducted by the United States European Command, comprised part of the United Nations effort to provide humanitarian relief to victims of the civil war in Rwanda. In keeping with its global responsibilities, ACC initiated a series of "Global Power" missions in 1993. ACC's bomber wings are required to perform out-of-CONUS training flights to demonstrate the capability to perform their "quick reaction" worldwide mission. On one of the global power missions, two B-1 Lancer aircraft of the 28th Bomb Wing, Ellsworth AFB, South Dakota, set a B-1 flying time record on the first leg of their round-the-world flight, 11–13 August 1993. The following year, two B-52s from the 2d Bomb Wing, Barksdale AFB, Louisiana, circumnavigated the globe in 47.2 hours, the longest jet aircraft flight in history. Air Combat Command units flew operational missions during the 2002 Operation Enduring Freedom – Afghanistan (OEF-A) and the 2003 invasion of Iraq, Operation Iraqi Freedom. The task of developing a comprehensive listing of ACC units present in Iraq, Afghanistan and other combat areas is particularly difficult as the events of 11 September 2001 and the Global War on Terrorism has made such an effort significantly difficult. The USAF seeks to improve operational security (OPSEC) and to deceive potential enemies as to the extent of American operations, therefore a listing of which units deploying where and when is unavailable. However, it is certain that ACC units are actively flying combat missions in the Southwest Asia theater of operations. NOTE: On 1 February 2010, the Eighth Air Force transferred to the Air Force Global Strike Command. The 7th Bomb Wing at Dyess Air Force Base, and the 28th Bomb Wing at Ellsworth Air Force Base also transferred to AFGSC on 1 October 2015, thus, ending 23 years of operational bomber service in ACC. In addition, units from Air Force Reserve Command's Tenth Air Force, and numerous other state and District of Columbia Air National Guard units are allocated to Air Combat Command when activated to federal service. Aerospace Command and Control & Intelligence, Surveillance and Reconnaissance (later, Air Force Command and Control & Intelligence, Surveillance and Reconnaissance) Center (see Agencies below): 29 July 1997 – 30 April 2002. On 17 June 2010, the GCIC was officially redesignated the Air Force Command and Control Integration Center or AFC2IC as a direct reporting unit to Air Combat Command (ACC). Air and Space Command and Control Agency (later, Aerospace Command and Control Agency; Aerospace Command and Control & Intelligence, Surveillance and Reconnaissance Center; Air Force Command and Control & Intelligence, Surveillance and Reconnaissance Center): 29 July 1997 – 30 April 2002. Air Combat Command (ACC) Logistics Support Group: 1 July 1994 – 16 September 1999. Much of this text in an early version of this article was taken from pages on the Air Combat Command website, which as a work of the U.S. Government is presumed to be a public domain resource. ^ "Air Combat Command > About Us > ACC History". www.acc.af.mil. Archived from the original on 15 September 2017. ^ a b c "Air Combat Command (USAF)". Archived from the original on 4 November 2016. ^ Pike, John. "Air Combat Command". www.globalsecurity.org. Archived from the original on 19 October 2017. ^ "ACC Leadership". www.acc.af.mil. Archived from the original on 5 October 2018. ^ "United States Air Force Weapons School". Archived from the original on 7 December 2017. ^ "57th Wing". Archived from the original on 6 October 2017. ^ a b "Air Combat Command > Home". www.acc.af.mil. Archived from the original on 24 January 2007. ^ "Air Combat Command". Archived from the original on 27 May 2017. ^ a b c d e f g h i j k l m "ACC History". Air Combat Command. Archived from the original on 4 November 2016. Retrieved 2 November 2016. ^ "Air Force Historical Research Agency". www.afhra.af.mil. Archived from the original on 17 December 2014. ^ "AFWA re-designated as 557th Weather Wing". Archived from the original on 15 February 2017. ^ "AFC2IC's History" (PDF). Air Force Command and Control Integration Center. Archived from the original (PDF) on 16 February 2013. Retrieved 2 November 2016. ^ Bailey, Carl E. (7 October 2016). "Air Combat Command (USAF)". Air Force Historical Research Agency. Archived from the original on 4 November 2016. Retrieved 2 November 2016.